Shortly after World War II, margarine replaced butter in the U.S. food supply. 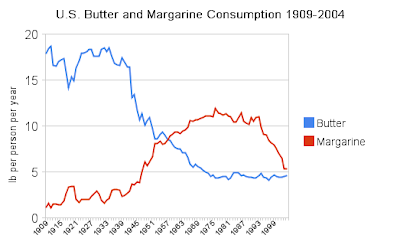 Margarine consumption exceeded butter in the 1950s. By 1975, we were eating one-fourth the amount of butter eaten in 1900 and ten times the amount of margarine. Margarine was made primarily of hydrogenated vegetable oils, as many still are today. This makes it one of our primary sources of trans fat. The consumption of trans fats from other sources also likely tracked closely with margarine intake. Coronary heart disease (CHD) resulting in a loss of blood flow to the heart (heart attack), was first described in detail in 1912 by Dr. James B. Herrick. Sudden cardiac death due to CHD was considered rare in the 19th century, although other forms of heart disease were diagnosed regularly by symptoms and autopsies. They remain rare in many non-industrial cultures today. This could not have resulted from massive underdiagnosis because heart attacks have characteristic symptoms, such as chest pain that extends along the arm or neck. Physicians up to that time were regularly diagnosing heart conditions other than CHD. 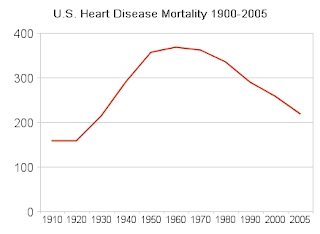 The following graph is of total heart disease mortality in the U.S. from 1900 to 2005. It represents all types of heart disease mortality, including 'heart failure', which are non-CHD disorders like arrhythmia and myocarditis. The graph above is not age-adjusted, meaning it doesn't reflect the fact that lifespan has increased since 1900. I couldn't compile the raw data myself without a lot of effort, but the age-adjusted graph is here. It looks similar to the one above, just a bit less pronounced. I think it's interesting to note the close similarity between the graph of margarine intake and the graph of heart disease deaths. The butter intake graph is also essentially the inverse of the heart disease graph. Here's where it gets really interesting. The U.S. Centers for Disease Control has also been tracking CHD deaths specifically since 1900. Again, it would be a lot of work for me to compile the raw data, but it can be found here and a graph is in Anthony Colpo's book The Great Cholesterol Con. Here's the jist of it: there was essentially no CHD mortality until 1925, at which point it skyrocketed until about 1970, becoming the leading cause of death. After that, it began to fall due to improved medical care. There are some discontinuities in the data due to changes in diagnostic criteria, but even subtracting those, the pattern is crystal clear. The age-adjusted heart disease death rate (all forms of heart disease) has been falling since the 1950s, largely due to improved medical treatment. Heart disease incidence has not declined substantially, according to the Framingham Heart study. We're better at keeping people alive in the 21st century, but we haven't successfully addressed the root cause of heart disease. Was the shift from butter to margarine involved in the CHD epidemic? We can't make any firm conclusions from these data, because they're purely correlations. But there are nevertheless mechanisms that support a protective role for butter, and a detrimental one for margarine. Butter from pastured cows is one of the richest known sources of vitamin K2. Vitamin K2 plays a central role in protecting against arterial calcification, which is an integral part of arterial plaque and the best single predictor of cardiovascular death risk. In the early 20th century, butter was typically from pastured cows. Margarine is a major source of trans fat. Trans fat is typically found in vegetable oil that has been hydrogenated, rendering it solid at room temperature. Hydrogenation is a chemical reaction that is truly disgusting. It involves heat, oil, hydrogen gas and a metal catalyst. I hope you give a wide berth to any food that says "hydrogenated" anywhere in the ingredients. Some modern margarine is supposedly free of trans fats, but in the U.S., less than 0.5 grams per serving can be rounded down so the nutrition label is not a reliable guide. Only by looking at the ingredients can you be sure that the oils haven't been hydrogenated. Even if they aren't, I still don't recommend margarine, which is an industrially processed pseudo-food. One of the strongest explanations of CHD is the oxidized LDL hypothesis. The idea is that LDL lipoprotein particles ("LDL cholesterol") become oxidized and stick to the vessel walls, creating an inflammatory cascade that results in plaque formation. Chris Masterjohn wrote a nice explanation of the theory here. Several things influence the amount of oxidized LDL in the blood, including the total amount of LDL in the blood, the antioxidant content of the particle, the polyunsaturated fat content of LDL (more PUFA = more oxidation), and the size of the LDL particles. Small LDL is considered more easily oxidized than large LDL. Small LDL is also associated with elevated CHD mortality. Trans fat shrinks your LDL compared to butter. In my opinion, it's likely that both the decrease in butter consumption and the increase in trans fat consumption contributed to the massive incidence of CHD seen in the U.S. and other industrial nations today. I think it's worth noting that France has the highest per-capita dairy fat consumption of any industrial nation, along with a comparatively low intake of hydrogenated fat, and also has the second-lowest rate of CHD, behind Japan. "Butter from pastured cows is one of the richest known sources of vitamin K2." Do you have any reference to support this claim? To my knowledge (and I have read several studies on vitamin K and K2 in particular) butter is not a notable source of vitamin K2. Best sources are natto (the Japanese soy product) and aged cheeses like Edam and Gouda. Stephan, have you read this article? Trans fat and Omega 6 and oxidation are big players in vascular damage. Does the commonly used cholesterol figure in LDL include cholesterol esters? There is a flaw in this argument. Heart disease develops slowly over time. The heart attack that took place in 1950 was the end result of physiological changes that took place in 1920. So dietary (and other) changes that occurred in 1950 should be mapped to health outcomes in the 1970s, not the 1950s. But the increase in CVD death in the period charted is more likely to be the result of the development of effective blood pressure pills. Before the discovery of effective blood pressure medicines, many people with heart disease died of kidney failure due to uncontrolled high blood pressure before their arteries clogged to the point where they had heart attacks. With the use of diuretics, these people lived to have heart attacks. One last issues is that 1950 marks the boundary where plastics came into our environment. The curve you show for use of margarine is very similar to that of the replacement of metal, wood and cloth with plastics. Another similar chart is probably sun exposure. Once people started watching TV time outside dropped and that lowers Vitamin D which appears to be a major factor in the deposition of calcium in the arteries. Just discovered you blog, great comments. Cholesterol is not the cause of heart disease. Cholesterol lowering meds will go down as one of the great frauds of all time. It took Matoff many years to steal $50 billion,statins steal $30 billion per year! Oxidized or Glycated LDL is retained the arterial wall only in the presence of low level inflammation, mostly caused by exessive intake of Omega-6 and simple carbohydrates. As a heart surgeon I treated atherosclerosis with a scalpel for many years, I now know it can be prevented and treated by the correct diet. Please see www.inflammationawaresnessnow.com for more information. Stephan is using a little exaggeration here. The MK-4 form of K2 is found in relatively low concentrations in virtually all animal sources (e.g., fats, fatty organs, eggs). Hunter-gatherers would have obtained a fairly large amount by virtue of whole-carcass consumption of all animals, from insects to as big as they could kill. "Fairly large amount" is some quantity > 250mcg and < 1mg. Natto and aged cheeses provide MK-7 (and others in the series, but little MK-4) which has been shown to have positive effects, but is not the form created within mammals, which is MK-4. Perhaps you should read a bit more of Stephan's blog and follow his links more closely. I wonder where you see the damage. ;-) I am not fond of margarine either. Some of the healthiest food cultures, the Japanese and the Mediterranean kitchen, don't use much of either. The recent Dutch studies show that menaquinone-7 (MK-7) is the preferred form of vitamin K, not menaquinone-4 (MK-4). What counts is the very long half-life of MK-7. A long half life might have some benefits if you take a large dose once awhile. If you eat a MK2-rich diet that benefit would disappear. Good comments by Jenny. Those are alternative explanations worth exploring in more detail. Not fond of margarine? How come you still recommended them in your book? "No other menaquinones such as MK-3, MK-5, MK-6 or higher were detectable in any of the organs." The reference is "Nutrition and Physical Degeneration" by Weston Price. He found that the K2 content of butter varies 50-fold based on the diet of the cows. Natto contains a lot of K2, but it's the MK-7 form, which is not the form synthesized by mammals and may not have the same effects as MK-4. Yes, I've read it. It was very enlightening. I don't mean to imply that the shift from butter to margarine was the only factor. But 15 years is enough time to develop heart disease. You have teenage kids now whose arteries are full of plaque. Thanks for the link. That looks like an interesting site, I'm going to poke around. I consider cold pressed vegetable oils, like extra virgin olive oil and canola/ rapeseed oil to be the best choices. If those are not an option, the second best choice are the good quality margarines (those which contain no trans fats and have some omega-3 fats). This is also the policy the professor Walter C. Willett has in his book Eat, Drink, and Be Healthy. You should really get acquainted with the research work done by the Dutch vitamin K scholars Vermeer and Schurgers. This will save everyone's time and more readers will follow the the link. This is a wonderful article. As you so aptly pointed out, the creation of margarine and other "pseudo-foods" was the beginning of the decline in health. Why? The human body was not designed to, nor can it adapt to processing chemicals. These man-made food substances turn on the inflammation process continuously causing most every disease we know of including heart disease. The creation of Crisco in the early 1900’s set the stage. My grandmother gave me a cookbook from 1907 she purchased to learn about this new “substance.” The book was filled with recipes helping the homemaker switch from lard to this new concoction. She never did nor did my Mom buy into margarine. My grandmother lived to age 95, my Mom to 85. Had she not fallen, she’d be 93 today. Dr. Dwight Lundell has written a new book, "The Cholesterol Lie" I think you’ll find fascinating in your research. If you opt-in here http://InflammationAwarenessNow.com you’ll receive his 3 part report on the real cause of heart disease. His recommendations for bringing inflammation to safe levels are simple (without medications) and easy for anyone to follow. Thanks for this vitally important information. I'm not all that sold on the idea that teenagers have plaque in their arteries because of what they have been eating. We also are seeing a dramatic rise in obesity and Type 2 diabetes in toddlers who are much too young to have developed diet-related disorders. There's a good body of research which was done in the 1960s which found that it was impossible to get a normal toddler to overeat, even when that child was given unlimited access to foods of all types including desserts. The kind of pathology we are seeing in these toddlers and the children they become points to dramatically damaged regulatory systems and metabolisms. When you look at what BPA does to a rat exposed to it in the womb, what you see looks a lot like what you see in many kids today, who have been drinking from heated BPA baby bottles and eating preserved foods stored in BPA-lined cans. But beyond that, plaque appears to be a side effect of low grade inflammation. We have a huge increase in autoimmune disease in children now, too, so it is possible there is a lot of undetected subclinical inflammation occurring in those children, who because they don't have the HLA profile needed to develop something obvious like Type 1 diabetes go undetected. So while diet might play some small role in the growth of plaque and margarine is definitely bad for us (I haven't eaten it in a decade, ever since learning about trans fat), my guess is that the health problems we are seeing in children are just as likely to be coming from the penetration of soy into every bit of processed foods as well as BPA exposure. Low grade systemic inflammation certainly has a place in the development of coronary heart disease. However, heart disease is multifactorial and inflammation does not exclude other factors. Poor cholesterol ratios (TC/HDL) is still a risk factor. And there are others: cholesterol oxidation, insulin resistance, free radicals, lack of omega-3 fatty acids (increases the risk of arrhythmias and thrombosis), endothelial dysfunction, vascular and aortic calcification etc. Juhana: I seem to know pretty well what you recommend. However, my very imflammation-prone genes fight imflammation much better with minimal omega-6's and with lots of milkfat. An btw, according to the publications best way to increase TC/HDL ratio (and to keep the HDL securely high, as well) is to cut carbs and especially grains... and to increase millkfats in one's diet. I too would like to get to grips with HTML. An idiots guide of basics would be great. What is so hard to get ones head around is that excess Omega 6 and lack of 3, excessive carbs, fructose, and lack of A D iodine and minerals, arguably are responsible for the increase in conditions related to oxidative stress and inflammation. Environmental factors exacerbate the situation. I do not know enough about BPA to comment further on the scope of its impact but am very convinced after 3years of being a nerd, that the factors out lined above, play a very large part in the rises we are seeing inflammation and oxidative stress. Author Omega Six The Devils Fat. Here's my reason for thinking diet is central: healthy cultures around the world developed heart disease along with a number of other problems when they were introduced to flour, sugar and industrial vegetable oil, without being surrounded by all the chemical contaminants we have here in the U.S. I agree that many people today have severely damaged metabolisms, but I think diet changes could easily account for the majority of it. True. I'm not suggesting decreased butter and increased margarine are the only culprits. Sugar and flour alone seem capable of destroying health, as judged by what has happened to traditional cultures around the world as they adopted Western foods. You might be able to parse out the health effects of each change, but it's pretty challenging because they often all arrive together. Jenny wrote: "There is a flaw in this argument. Heart disease develops slowly over time. The heart attack that took place in 1950 was the end result of physiological changes that took place in 1920. So dietary (and other) changes that occurred in 1950 should be mapped to health outcomes in the 1970s, not the 1950s." Keep in mind that trans fats became available to the public in 1910, with the release of Crisco. And from this beginning, it became increasing used in other foods. Almost overnight people switched from cooking and baking with lard to Crisco -- after all, who wants to use gross animal fats when they can buy neatly packaged plant-based fat. It was an easy sale. Juhana, see this comment by Chris Masterjohn about butter versus olive oil and corn oil, which is pertinent. we also have to think about what the parents ate before and while the baby was still in the womb...If they were eating margarine and other veg. oils they were setting there child up for a metobolic problem before they were even born. I think if we eat the correct type of nutrition the human body can fend off alot of environmental pollutants. I agree with jenn...we all could use some more sun in our life...get out and play with your children! Regarding hyperlinks, the easiest way is to open a second browser window/tab in your desired site and then copy the address from the little window at the top of your browser; i.e., select the text and then hit Control-C (windows) or Command-C (apple). You can do a "view source" to see examples of hyperlinks. "a" stands for anchor. "href" for hypertext reference. I read the comment you provided. I think that it was too simplistic. First, I have never suggested that people should use olive oil only. It does not contain omega-3 fats. So olive oil has to be complemented with fish oils or other omega-3 fats. Masses of people like simple solutions. If one shouts: "Carbs are evil! ", he will get a large following. So does the one who writes: "Eat like your grandmother did!" If you try to suggest that heart disease is multifactorial and it is better to target several risk factors at the same time, you never get a large following. Still I prefer this multifactorial approach because I want to understand the phenomena as a whole and I want to provide honest solutions, even if they are not the most simple. I very much agree that refined carbs are bad. Still I ask: "How is it possible that in those two industrialized nations where the heart disease is the lowest - Japan and France - refined carbs are part of the diet (in Japan the white rice and in France the croissants and baguettes)?" Please notice that I am not suggesting that refined carbs are healthy. They are not. They are bad for your health. Still I ask this challenging question. I agree that there is no one diet for optimal health for everyone. Weston Price found a variety of healthy people eating a variety of native diets. He also found a variety of people eating native diets that were not as healthy. 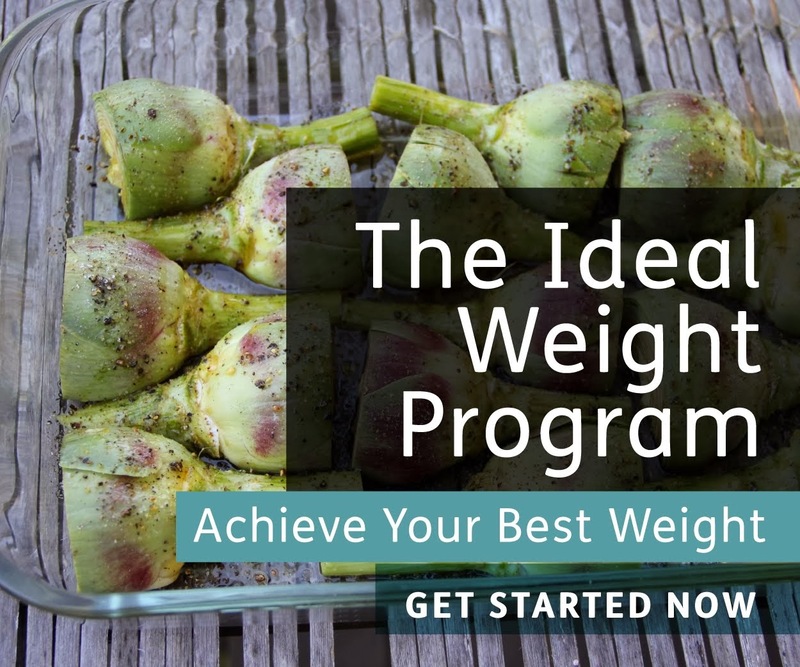 However, in every case, when these people abandoned their native diets for a more modern diet, high in refined sugar and refined vegetable oils and low in nutrients, their health declined dramatically. I do believe that there are certain dietary factors that are bad for everyone. Too much refined sugar, with its addicting fructose and too much polyunsaturated fat mainly in the form of omega-6 rich vegetable oils and trans fats are probably far and away the worst factors in generating heart disease and cancer, but certainly not the only factors. Starchy foods like white flour, potatoes, and rice don't have fructose, unless it is added and without the added refined sugar with its fructose, these foods are not likely to cause problems for most healthy people, as long as they are eaten in moderation and not at the expense of nutrient dense foods. Oh, and happy new year !!! I believe that it is healthy to limit the intake of refined carbs. That is obvious. But why do you have to combine it with an increased intake of animal foods as low-carbers often do? Juhanna, I consider myself a reformed low-carber, meaning I no longer automatically think that all carbs are evil, and I don't think that all animal products are magical. What is important to get from animals are the fat-soluble vitamins that Weston-Price found to be so important. But we get those from the parts of the animals that are no longer commonly eaten. It's pretty easy to get enough protein for a normal person without going crazy with muscle meat. So if we can't get organs from grass-fed animals, or have never developed the taste for organs, we are left with supplementation to get A, D and K as well as trace nutrients. Enter fish and fish live oils, etc. Or, as I do, convenient capsules since I don't like travelling with a bottle of fish oil in my baggage. The question then becomes the same one you asked...if we can supplement the nutrients that are most important to get from animals, it is that important to eat animal products? I think probably not, although I don't shy away from animal fat or meat sources. I just don't think they are as critical as the low-carb lobby makes them out to be. If the carbs are well-chosen and well-prepared for digestion (soaking, fermentation, etc.) then there should not be an issue for someone who has not already wrecked their metabolism. All this to say I agree with your last post. The reason I like this blog is that Stephan actively explores new hypotheses. Too many big-name blogs are rooted in their (published) paradigm and repeat it endlessly, unable to consider new and possibly game-changing information because they are professionally and financially tied to their established position. This is why I've joked in that past the Stephan can never write a book! I was quite surprised to to hear your reason the for the high animal food consumption: the fat soluble vitamins. Let's investigate this subject a little bit. First I want to reveal where I stand. I follow a kind of fusion kitchen, absorbing influences from all over, but I guess my diet could be best defined as a mixture of Mediterranean and Japanese diets. I get vitamin A from a moderate amount of dairy and eggs (3-4 weekly). In addition I get an ample amount of beta-carotene from vegetables. I am not striving to get high amounts of vitamin A as it is toxic to bones and may lead to osteoporosis. I eat a lot of fatty fish, but still I supplement with a rather high dose of vitamin D. I think that it is a common misunderstanding to think that we should get our vitamin D from the diet. Actually we get about 90 percent of our vitamin D from cutaneous production, and only about 10 percent from diet, unless we supplement. I receive my vitamin K from two sources. First, I eat green vegetables (kale, spinach, broccoli, and/or Brussels sprouts) every day. Secondly, I eat natto every other day or so. So my vitamin K intake is actually very high even without animal sources, and I do eat some cheese. So, I do not think that in order to have a good intake of fat soluble vitamins one should eat a lot of animal products. "If the carbs are well-chosen and well-prepared for digestion (soaking, fermentation, etc.) then there should not be an issue for someone who has not already wrecked their metabolism." Well said! Actually diets high in complex carbs and plenty of vegetables and whole fruits have been associated with less weight gain and lower incidence of diabetes. Only after one has "wrecked metabolism" is there the need to reduce carbs. "The reason I like this blog is that Stephan actively explores new hypotheses. Too many big-name blogs are rooted in their (published) paradigm and repeat it endlessly, unable to consider new and possibly game-changing information because they are professionally and financially tied to their established position." I agree with this also. 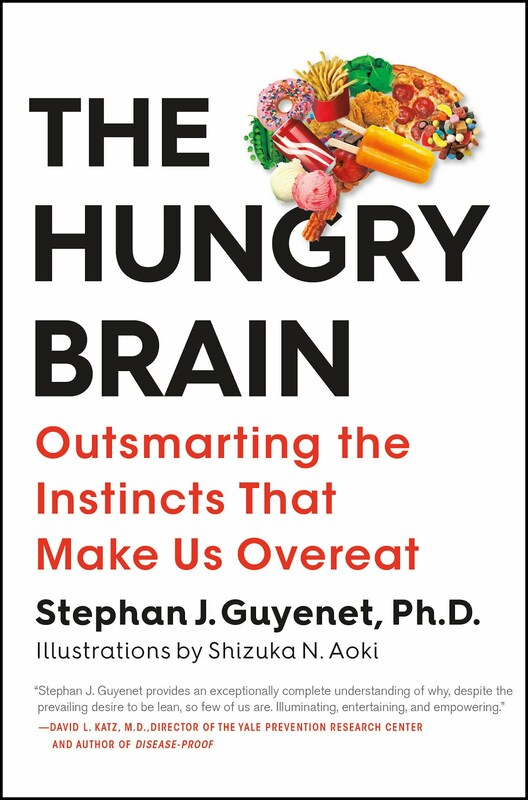 Although I do not always agree with Stephan, he writes in an interesting way and often he investigates new avenues. I believe low-carb diets are important for those who are over-weight, pre-diabetic, or diabetic. This is a large percentage of the population in some parts of the world nowadays. In going on a low-carb diet, these people need to limit polyunsaturated fat to no more than about 4% of total calories long-term for optimal health. The easiest way to do that on a high-fat diet is using animal fats from pastured ruminants as a primary fat source. For those who are not diabetic and are at an optimal weight, I see no problem with starchy glucose based carbs, including grains and tubers, as long as they are properly prepared and not eaten in excess. Some people may have issues with gluten as Stephan has pointed out, although sour dough preparation may reduce the number of affected people. I do believe that Price was right when he concluded that the healthiest people he studied included animal seafoods, organ meats, and/or dairy in their diets. These foods are not only nutrient dense, but also have excellent nutrient availability, which is not always the case with plant foods. For instance, only about 10-20% of the calcium in spinach is absorbed in digestion and it's not just the oxalate that accounts for the poor absorption. I personally prefer the taste of vegetables, grains, and tubers with lots of butter and/or cheese added. I suspect that adding these fats also improves the nutrient availability of these foods as well. 1. Scott W. did not attempt to justify high consumption of animal foods; he justified some consumption of animal foods, so I don't know why you're trying to argue his own point back to him. 2. "I eat a lot of fatty fish, but still I supplement with a rather high dose of vitamin D. I think that it is a common misunderstanding to think that we should get our vitamin D from the diet. Actually we get about 90 percent of our vitamin D from cutaneous production, and only about 10 percent from diet, unless we supplement." Your words here are very confusing. You say that we shouldn't get our vitamin D from the diet, then you say you supplement (add it to your diet). These are directly contradictory. Secondly, where did you get the figure that 90% of our vitamin D is synthesized in skin and 10% is obtained in food? At this time of year in the temperate regions of the northern hemisphere, people are synthesizing almost no vitamin D in their skin because the sun is too low and most skin is covered up. Thus, for much of the year in much of the world, nearly 100% of vitamin D needed by the body must be ingested in food or supplements. You say you are following a japanese style of diet...which is fine. In the book optimal nutrition and homo optimus Jan Kwasniewski discusses his high fat diet compared to the japanese diet... he believes the japanese diet is the only other correct type of nutrition to follow other than his, because the japanese don't mix different fuels(carbs and fats). The japanese diet is low in fat, high in protein and carbs, getting most of your energy from carbs, and there carbs mostly being veggies and rice. They don't mix fuels. The only problem now for the japanese and stephen has already mentioned this now is that they have added wheat into there traditional diet and there health has taken a toll. anyways...it sounds like you have a good diet. Stephen has mentioned this alot and i have to agree with him...Wheat and vegetable oils have wrecked alot of traditional diets. Whether you eat high fat or high carb...i think its important to stay away from wheat and to many vegetable oils, and i think you will be fine. Personally, i just feel more nourished, more energy, and more alive on a high animal fat diet....and more bloated, and hungry when i eat to many veggies and fruit. Re: "If the carbs are well-chosen and well-prepared for digestion (soaking, fermentation, etc.) then there should not be an issue for someone who has not already wrecked their metabolism." I think you both opened a can of worms! In my humble and personal opinion plant based diets are _survivable_ but secondary to animal based diets, in terms of health benefits, longevity (believe but can't prove) and stamina. The other thing is that fruit and veg consumption is a marker of income level and how much people care about health. Some epi studies, but not all, control for income level. But there's no way to control of the fact that most people who see themselves as healthy tend to make more of an effort to do thinks like eat vegetables, take the stairs, avoid saturated fat, etc. People who don't feel good to begin with make less of an effort. I think it's a huge confound in modern epi studies and one that creates a self-fulfilling prophecy. Once a culture 'knows' what is healthy, healthy people within that culture will begin living that way, and the epi studies will pick up on it and reinforce those ideas further. I may do a post on this at some point. It's interesting to note that the healthiest people in the world (from the perspective of non-infectious disease) don't eat very many vegetables. Many hunter-gatherers and healthy traditional cultures around the world eat virtually no vegetables (defined as low-calorie plant foods). I don't mean to imply that they have no place in the diet, but they are certainly not necessary for optimal health. I agree, epi studies tend to be biased and their authors do not always seem to be very proactive in revealing or neutralizing those biases. An infamous British vegetarian study "proving" that vegetarians are healthy springs to my mind (I am still recovering after that ban from vegan forum, sorry for a digression). I noticed that too. I find it fascinating that some of the most long lived people in the world live in the mountains of Peru and Equador and live mostly off potatoes and not much anything else! "Fruit and vegetables (2) damage your DNA... latest study headline." a funny thing about your last comment about income and the rich consuming more veggies and fruit, its so true. I cashier in this health food store in super swanky del mar california, and all these rich people come in and buy tons of veggies and fruit, and drink there fruit smoothies and green drinks...along with there low fat or 0% greek yogurt, wine, and whole wheat bread. 95% of them are still over weight. THe ones who arent over weight are the very unhealthy looking marathon runner types. The die hard surfers are skinny for the most part but eat like crap though...lucky for them they do a great anerobic activity like surfing, and Art De Vany has mentioned that surfers stay lean also because of the brown fat they build up from surfing in cold water for long periods of time. But the incorrect nutrition can't save there skin from the sun...the older surfers have some of the crustiest skin i have seen. It would be as easy as eating butter and eggs. Put on as much sunscreen as you want...it only makes things worse. "I believe low-carb diets are important for those who are over-weight, pre-diabetic, or diabetic." I agree. This is just what I meant when I wrote about wrecked metabolism. "In going on a low-carb diet, these people need to limit polyunsaturated fat to no more than about 4% of total calories long-term for optimal health." Any reliable reference to support this view? "I do believe that Price was right when he concluded that the healthiest people he studied included animal seafoods, organ meats, and/or dairy in their diets. These foods are not only nutrient dense, but also have excellent nutrient availability, which is not always the case with plant foods. For instance, only about10-20% of the calcium in spinach is absorbed in digestion"
Organ meats are too high in vitamin A (causes bone loss). In addition to that, what was healthy 100 years ago, may not be anymore. Organ meats are also high in heavy metals (cadmium) and they may contain residues of drugs and hormones fed to animals. Calcium is not the reason to eat spinach but rather the high vitamin K, lutein and zeaxanthin content. "Scott W. did not attempt to justify high consumption of animal foods; he justified some consumption of animal foods, so I don't know why you're trying to argue his own point back to him." I were not trying to argue his point back to him. That point in my message was meant for other people following this discussion. "Your words here are very confusing. You say that we shouldn't get our vitamin D from the diet, then you say you supplement (add it to your diet). These are directly contradictory. No, I just stated the fact. Globally the cutaneous productions accounts about 90 percent of the vitamin D production. "Secondly, where did you get the figure that 90% of our vitamin D is synthesized in skin and 10% is obtained in food?" "You say you are following a japanese style of diet...which is fine." No. I said that I follow a fusion diet, best described as a combination of Mediterranean and Japanese diets. My diet is moderately high fat. I eat as much fat as I feel that is the most palatable. That makes my diet about 40 percent fat from energy intake (I have assessed my nutrient intake now and then). "Eating all those veggies high in vitamin k isn't going to get converted to vitamin k2..."
"In my humble and personal opinion plant based diets are _survivable_ but secondary to animal based diets, in terms of health benefits, longevity (believe but can't prove) and stamina." "It's interesting to note that the healthiest people in the world (from the perspective of non-infectious disease) don't eat very many vegetables. I have not been promoting a vegetarian diet here. I have been promoting the idea of higher intake of vegetable foods. These are two different things. But even if we consider vegetarian diets, the lactovegetarians seem to manage pretty well - just think about the very high life-expectancy of the vegetarian Seventh-day Adventists. Yeah that sounds familiar. I've also noticed that often people who eat like that are thin but have bad skin. I'm not criticizing your position on vegetables. I think it's possible to be healthy on a mostly plant-based diet. I was just stating that I don't think vegetables are an absolutely necessary part of a healthy diet. They may still be useful in some contexts, particularly for their mineral content and flavor. I have to disagree with you about dairy not being nutrient dense. It's able to exclusively support a young animal during its most rapid period of growth. It may not contain 100% of the recommended daily allowance for every nutrient, but I would argue that's a failing of the nutrition authorities rather than a failing of evolution. The Masai subsist quite well on a diet that is almost exclusively unpasteurized full-fat dairy. Their Zebu cows produce twice the milkfat of our wimpy Holsteins. The only other things they eat are blood and meat from time to time. On that diet, they are strong enough to hunt lions for sport with nothing but a spear and shield. By dairy not being nutrient dense I mean that it does not contain very much nutrients per the amount of energy it provides. Here is an interesting collection of graphs made my a vegan doctor. Please ignore the fact that he is vegan, that is not essential here, but the fact that vegetables in average contain most nutrients per calories. "As I wrote, I eat natto. Check it out to find how much it contains vitamin K2. ;-)"
As far as I know, natto contains K2 Mk-7, but no Mk-4. If you think Mk-7 is superior, then natto is most likely the best choice (if you are able to get that awful stuff down). I tend to side with Stephan and prefere Mk-4. If someone eats a diet without a trace of Vitamin D, he gets 100% of his Vitamin D from sun exposure. That doesn´t mean that this is a good thing. Even if you are right about your 90% that doesn´t tell you anything. You just can´t compare someone living in Uganda with someone in Finnland. "...but the fact that vegetables in average contain most nutrients per calories." But vegetables contain very little nutrients per volume. So you would have to eat a lot of vegetables in terms of volume compared to nutrient dense foods like eggs (or dairy). In addition to that animal products have usually a much higher bioavailability than plants. Stephan, I consider raw milk to be a nutrient dense food simply because it's the complete package of nutrients in a form well assimilated. I don't know of any other single food that compares in this regard. Juhana, when you look at diets even a few hundred years ago, the amount of polyunsaturated fat had to be no more than 5-10% of calories, even for those groups that ate high-fat diets. People simply did not have available major food sources that were high in PUFA (more than about 10% of calories as PUFA). Nuts are a possible exception, but they were not eaten in large quantities. Only with the advent of cheap vegetable oils like corn oil and soy oil has the amount of PUFA increased dramatically in the human diet. Barry Groves mentions that early organ transplant patients were given linoleic acid in large amounts to suppress their immune system, because evidence of the immuno-suppression was supported by scientific research. He also mentions that this approach was abandoned after many patients very quickly came down with bizarre cancers. I have not researched the scientific journals, but I have read that there is quite a bit of evidence that PUFA is highly prone to peroxidation and these peroxides are quite damaging to our health in a variety of ways. So, it only makes sense to limit their intake as much as possible and a goal of about 4% is achievable. On an interesting side note, I noticed that another omnivore, the pig, apparently accumulates more PUFA in the meat on commercial diets high in grains than in the wild. Wild boar meat has about 3.6% of calories as PUFA versus about 7% in commercial pork meat. It would be interesting to know if the same happens to humans on diets high in grain. Try feeding a baby nothing but vegetables and see how he turns out! Vegetables contain nutrients, but they are missing many of the most essential nutrients such as K2 MK-4, preformed vitamin A, vitamin D, B12, EPA, DHA, and probably others that haven't been identified or whose importance has not yet been appreciated. Full-fat milk is a complete food. Infants and adults alike can survive just fine on nothing but milk. I would say that qualifies it as nutrient-dense. Healthy traditional diets are typically less than 2% linoleic acid, with variable amounts of long-chain omega-3. Humans do indeed accumulate linoleic acid, up to 30% of body fat and perhaps more. What you wrote about babies is obvious. I repeat that I am not proposing that we should eat vegetables or vegetable foods only. Did you know that you and myself seem to make quite an interesting experimental couple? We share sociogeographical site & time, similar age and maybe even some similarities in our bodies imflammatory response to the normal, recommened diet. So, while you chose the fish and oil based fusion kichen for your optimum, I'm on Kwasniewski's OD with lots of milkfat, without fish and without supplements. Actually, we seem to have made pretty much opposite choises in all calories, weather from carbs, proteins OR fats. Time may not tell, which style is ultimately better. But time will certainy tell how we survive on paths chosen. One thing I've never understood: if inflammation is the enemy, what about the high levels of arachidonic acid found in meat and eggs? Isn't AA inflammatory? It's a fair point. The tendency to inflammation depends on many factors, including the amount of essential fatty acid precursors, the ratio of AA to EPA, and many others. The idea that AA leads to inflammation is a bit of an oversimplification, if I understand correctly. I won't pretend to understand it all. Sorry I can't be more helpful. Maybe Robert can answer the question better. Trans fat naturally occurs in some foods, like butter, but are also formed in the processing of some foods where product texture and shelf life are desired. I’ve learned a lot about this subject because I work with the National Association of Margarine Manufacturers. In addition, heart disease runs in my family so I’ve got a personal interest in this subject as well. Using new technologies, margarine manufacturers have met the challenge and eliminated or reduced trans fat in margarine products, making a good product even better. In fact, almost every soft margarine product now shows “0 grams trans fats” on its label. In addition to great taste and convenience, margarine contributes to lower blood cholesterol levels when substituted for butter and it contains vitamin E and essential fatty acids. When comparing margarine to butter, many margarine products are the recommended alternative as stated by of the American Heart Association, as well as the Federal government’s National Cholesterol Education Program. And yes, it’s still an economical choice for the consumer. Margarine has certainly improved with age. Trans fats do occur in butter, but they are mostly not the same as those that occur in hydrogenated oils. They have been part of the human diet since the beginning (they also occur in ruminant fat tissue), whereas vegetable trans fats are new. Margarine is allowed to say "0 grams trans fat" when it actually contains up to 0.5 g per serving. Furthermore, it's a new food without a successful cultural track record. I would treat it with a high degree of suspicion. The fact that the AHA recommends margarine is yet another reason to avoid it. Dear Stephan, are you aware of the Excel data available in this website? : http://www.heartstats.org/atozindex.asp?id=8 It includes a lot of European data, besides UK data. I believe it would be quite interesting to do with this data the same thing Ancel Key did but using this updated data. This is a suggestion for a next post in your blog, of course;) Regards. Thanks Ricardo, I wasn't aware of that. This is the second time I've found your site looking for different things on google. Great job! I really enjoy your articles and the comments. I discovered your blog recently and really appreciate your dedication to careful analysis of scientific studies. I've read in the past that a major reason for the decrease of CHD prevalence in the 70's and after was due to a decline in smoking rates. What are your thoughts? I'm not implying that improvements in medical technologies didn't help, just curious about what you've concluded about relationship with smoking trends. Something the “specialists” ignore wittingly or unwittingly is the fact that sugars and unsaturated fats may contribute to the inflammatory process through a well known reaction, the reaction of Maillard. All sugars contain a chemical function, an aldehyde, as is the case with glucose, or a ketone function, as is with fructose. Aldehydes and ketones react with amine functions, present on all proteins and nucleic acids (RNAs and DNA), to rearrange in a stable form, named Advanced Glycated End-products (AGE). Unsaturated fatty acids are oxidized in the presence of oxygen free radicals, such as superoxide, and generate ketones and aldehydes, and perform the same reaction as sugars do, thus generating AGEs. Now, if you have a look at the research results done with AGEs, you may understand the dark face of sugars and unsaturated fats on health, when they are ingested regularly in high amounts. for a series of posts called "AGE RAGE and ALE"
Jenny Said: "There is a flaw in this argument. Heart disease develops slowly over time. The heart attack that took place in 1950 was the end result of physiological changes that took place in 1920. So dietary (and other) changes that occurred in 1950 should be mapped to health outcomes in the 1970s, not the 1950s." Note the sharp drop off in Butter consumption around 1950 correlates to the peak in CHD in the 1970s so the theory is correct, and may speak to the preventative effects of butter on heart disease. This is one of those articles that serve as a wake up call for people who consume margarine a lot. I used to do that, but not anymore. Insufficient potassium and vitamin B-1 (thiamin) can not damage the heart significantly when both are deficient. This has important safety implications when supplementing each during heart disease, arrhythmias, rheumatoid arthritis, high blood pressure, gout, beri-beri, or diabetes caused or influenced by the deficiency of one of them. It is extremely important to know which kind of heart disease is involved. You may see this discussed in detail in http://charles_w.tripod.com/kandthiamin.html . This is probably the primary reason why the medical profession has not been able to prevent heart disease up to date and why potassium supplements cause neutral mortality statistics. Researchers almost across the board think that potassium has little impact on the body or/and is never deficient. This is a mistaken assumption. Most food processing procedures cause losses. Enormous attention is given to a single murder or handful of murders, while at the same time the food industry causing 500 thousand deaths from heart disease alone, gets almost no coverage. This is because a considerable fraction of their profits goes to promulgating these disasters by advertising and bribing politicians. Even the medical profession is responsible by procedures in hospital cafeterias. Copper is crucial for strength of arteries because of its role as part of lysil oxidase, which cross links elastin tissue. A deficiency is probably the main cause of aneurisms and therefore many strokes, hemorrhoids, and many bleeding problems, as well as high blood cholesterol and is probably involved by a synergistic affect in the cause of diabetes by chili pepper (see http://charles_w.tripod.com/diabetes.html ). You may see how to increase copper from food in http://charles_w.tripod.com/copper3.html and a discussion of copper physiology in http://charles_w.tripod.com/copper.html . Finding ways to repair the heart is useful, but there is no good substitute for not damaging it in the first place. You also may find a book about potassium nutrition as it relates to heart disease, gout, rheumatoid arthritis, high blood pressure, and diabetes, useful for your library. Its availability is through Paypal along with its introduction, table of contents and first two chapters may be accessed in http://charles_w.tripod.com/book.html . PS Dr. Rastmanesh, a nutritionist from Iran, would like to secure a position in an English speaking university. He has an impressive CV. If you know of an opening I will send you his CV. It is a travesty to leave that fine researcher over in that criminal country after he has gotten rid of rheumatoid arthritis for us. Polyunsaturated Fat Intake: What About Humans?